Sanjonotaki Falls is one of the largest waterfalls in Japan, 100m tall and 30m wide. 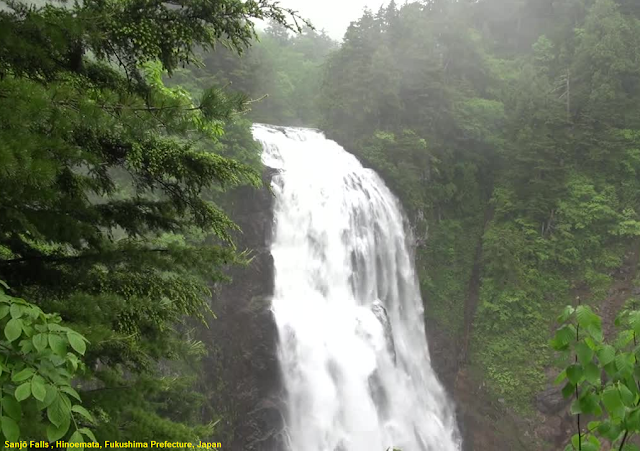 Because it collects all the water from Ozegahara, the wetland nearby, a huge amount of water passes through the falls. Such a large amount of water roaring down the falls is a spectacular view. The name Sanjo (meaning “triple rows”) comes from the fact that the waterfall splits into three rows when the water level is low. Sanjō Falls a waterfall in Hinoemata, Fukushima Prefecture, Japan, on the Tadami River in Oze National Park. It is one of "Japan’s Top 100 Waterfalls", in a listing published by the Japanese Ministry of the Environment in 1990. Although the trekking course from Ozegahara is a famous path, it is a highly undulating mountain route with a rough surface. You would be better to not take on the challenge unless you are definitely confident in your physical strength.